I'm so bad. Yes, I have my list, but I've deviated from the plan. I've added two books to my list. 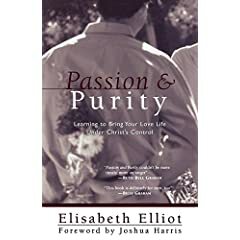 After hanging out in Blogland a while, I realized I must be the only thinking person in the Christian world who has not read Passion and Purity, by Elisabeth Elliot. It's probably because I got married about the time it was published, so it was too late, at that point! I was so excited that my library carried it, so I read it over my allotted three weeks, held open by a hair brush or tube of toothpaste, for my my daily reading while I dry my hair. Mrs. Elliot is so deep, so eloquent, that I'm sure my method of reading didn't do her justice. But the story of her courtship is so suspenseful I found myself saying, "When, WHEN, are they going to get married? Just do it, already!" Although my own "courtship" (we didn't know that's what it was - we just called it dating with conscience) with my husband wasn't nearly so complicated, my attitude toward purity was very much the same, even as a teen (I was 19 when we got married). I didn't understand it fully, but I knew guarding it was serious business. Waiting was a given. I am so thankful, even 21 years later (do the math and now you know my age!). I probably couldn't have articulated it, but somehow my husband and I did what I think it's Dennis Rainey, says (my butchered translation): "Run straight to Jesus. Then, while you're running, look over, and if anyone's running toward Jesus, too, say, 'Hey, wanna run together?' "
My own personal copy came from Amazon this week, so now I can "wow" you regularly with Elisabeth Elliot one-liners like, "If your goal is purity of heart, be prepared to be thought very odd." 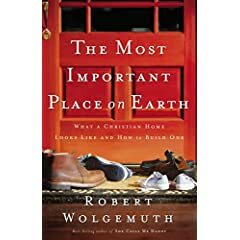 The second book I'm adding is The Most Important Place on Earth, by Robert Wolgemuth. I've actually read this one several times, but I saw it on Katrina's list, and pulled it out again. It has become our standard engagement or wedding shower gift. It is worth reading and re-reading. Here's the subtitle: What a Christian Home Looks Like and How to Build One. Yes, that's what I want to do. Mr. Wolgemuth writes so gracefully and inspiringly, I'm challenged with each turn of the page. It's not a bunch of lofty words, though, it's practical stuff. I hope you'll be inspired to add it to your list, too! Katrina at Callapidder Days has the master list of those of us participating. I'm sure it's not to late to join in! I've never heard of that Elisabeth Eliot book. I'm just now finding out about her and the treasure that her works are. From my friends in blogland. I'll have to look into this one. And the second one sounds very intrigueing too! I'll have to add it to the evergrowing list of great books I'm finding from this challenge. "Dating with conscience"--I love it! And RATS!...as if I didn't already have enough on my reading list, but the Wolgemuth book looks too good to pass up. Thanks! 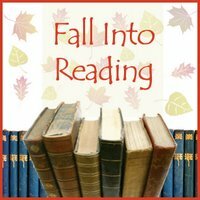 I am not sure how I found your site, but love the books you recommended! Elisabeth Elliot is one of my all time favorites. I am not familiar with the Wolgemuth book. I will have to track that one down! Katherine- what a blessing your blog has been to me. I discovered it through a friend and, although I am just now commenting, have been reading it for a few months. You are such an encouragement and inspiration. I (even as a college student) find myself learning from things that you blog. Thanks for that you bring to the blog-o-sphere!